Habit: Erect, 1--3 m; burl prominent (0). Stem: old stem bark persistent, gray, shredding; twig (and nascent inflorescence axis) sparsely short-nonglandular-hairy. Leaf: erect; petiole 3--8 mm; blade 1--3 cm, 1--2 cm wide, elliptic, bright green, shiny, puberulent, in age glabrous, base wedge-shaped to rounded, tip acute, margin entire, flat. Inflorescence: +- raceme, 0--1-branched; nascent inflorescence pendent, axis 0.5--1 cm, > 1 mm wide; bracts 2--6 mm, scale-like, deltate to acuminate, sharp-pointed, glabrous; pedicel 3--6 mm, glabrous. Flower: ovary glabrous. Fruit: 8--14 mm wide, depressed-spheric, glabrous; stones free. Chromosomes: 2n=26. 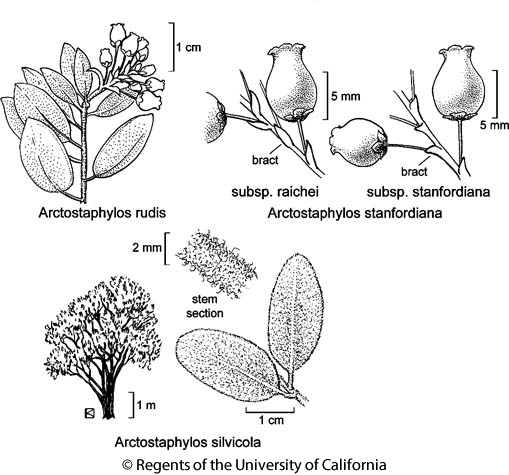 Citation for this treatment: V. Thomas Parker, Michael C. Vasey & Jon E. Keeley 2012, Arctostaphylos rudis, in Jepson Flora Project (eds.) Jepson eFlora, http://ucjeps.berkeley.edu/eflora/eflora_display.php?tid=76568, accessed on April 19, 2019.
s CCo, s SCoRO (Nipomo, Burton mesas, Point Sal, sw San Luis Obispo, nw Santa Barbara cos.). Markers link to CCH specimen records. Yellow markers indicate records that may provide evidence for eFlora range revision or may have georeferencing or identification issues. Purple markers indicate specimens collected from a garden, greenhouse, or other non-wild location.